He added more troops to the Afghanistan "surge" and shows no signs of giving up the fight in spite of obvious failure and the death of Bin Laden. He successfully watered down a bank reform law that Congress was determined to pass so that the methods and structure of Wall street have not changed in spite of its exposed corruption and disastrous level of concentration. Guantanamo Bay remains open forever. The Bush Tax cuts were extended. No taxes of any kind have ever been raised since his election (except on cigarettes). The stock market has gone up 50% since Mitt's inauguration! 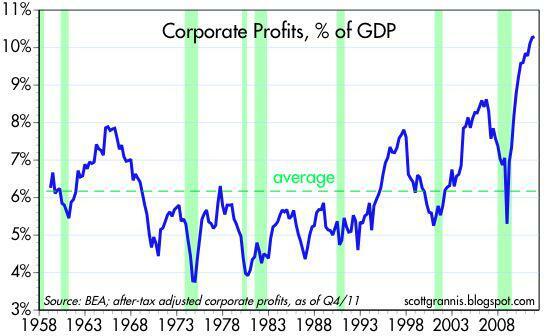 Corporate profits are at 10.3% of GDP – a new record, almost double their 2009 lows. The new health care plan includes a universal mandate – a long held policy supported by all Republicans and the Heritage Foundation, that forces sick free-loaders to pay into the system. The trade structure with China that guarantees American job losses and wage declines has been perfectly frozen to suit outsourcing mavens like Tim Cook. Yes Ron Paul isn't happy about the Mitt "Recovery Act" that provided stimulus to the dying economy but Mitt's defenders point out that 40% of that stimulus was in the form of tax cuts. Most of the spending went to save states that were in dire straits. Sometimes Mitt mentions that he and his wealthy friends like Warren Buffet should actually pay a higher tax rate since they can afford to, and their tax rates are lower that their secretaries'. His close friends have been quick to announce that he has no intention of raising the top rates. Critics point out that the trade and budget deficits are still at outrageous levels and there seem to be no policies to address either of them. Mitt is focusing instead on his record of significant employment gains. Many historians believe that Romney's tax record and stewardship of the economy during a crisis is so impressive that he will eclipse Ronald Reagan as the greatest Republican president of modern times. The Republicans have been very clear – they hate all bailouts. Hate radio polemicists attack all the congressmen who voted in favor of either the bank bailouts or the car industry loans – they're traitors. No argument that it had to be done to save the economy, will make them waiver. So in walk the Dems with a bill to remove oil drilling subsidies and the Repubs all vote it down – to a man. Apparently they love the idea of oil exploration so much that they are willing to jettison all their principles to help those poor suffering oil companies. Maplight.org points out that 83% of big oil lobby money goes to Republican members. Apparently 74% of the public want these subsidies to expire. It's a classic battle: the people verses corporate $ It was no contest. Does anyone really think there will be less drilling if we take away these tax breaks? It wasn't long ago that such fiscal profligacy was too small to matter. We would just chalk it up to corruption and move on. The current deficit chasm is so huge that fish in a barrel like this, should be easy pickings. The party of fiscal rectitude devotes half its air-time to telling us that Obama and all progressives are socialists. What is more socialist than subsidizing companies with an ROE of 26.9%? Can Public Sector Investment Save Us? I feel like I'm in a time machine when I hear the argument that all we need to do is fix our roads and bridges or spend more on education. The spending will solve the liquidity trap (Krugman) and the investment will revive our competitiveness. Really? Are poor roads and bridges the reason why we are apparently in decline? Do multinational no longer have any interest in US labor because their commute is long and bumpy? Let's compare our roads and phones to say – Viet Nam. My guess is we look pretty good. The improvement in American productivity from having better bridges will never offset the massive labor price differences between us and our currency fixing, import blocking trading partners. When that spread is narrowed multinationals will again hire US workers. All this other stuff is a rounding error. Mathematics told them to betray him. Ever country in the Euro zone understands that collusion is required. They must all stick to prescribed spending limits. The temptation is simple. Since the creation of the Euro, a participating country with poor credit has the ability to borrow at very low (German level) rates. The first country to do so will win but if they all do it, then the rates will rise for everyone and the Euro will break apart. The fines that are supposed to be imposed for breaking the budget rules are tiny compared to the fun Greece or Portugal can have if they borrow and spend without restraint. Dilbert (Germany) should understand. They did exactly what their math professor told us they would do.